You find Hotel Metropole at Place Brouckère, close to Theatre de Monnaie and the shopping street Rue Neuve. Sadly, there are just a few buildings left, like the Metropole left. The area has been ruined by a tasteless mishmash of buildings from different eras. It is situated by the de Brouckère subwaystation, and you can catch a subway/tram (Green line) from both Gare de Nord or Gare Centrale (Line 1a and 1b - direction Roi Baudoin / Bizet). 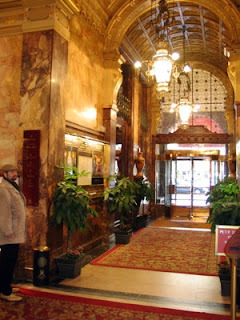 But it is not the area around the hotel that counts, but its interior. The service at the hotel Metropole is excellent, polite english-speaking staff took well care of you from you arrived until you left. We were lucky to have breakfast included in our price. The breakfast area were situated in the basement area, and we enjoyed a wonderful buffet in very stately manner. The interior of this wonderful hotel is to die for. You are back to the turn of the last century and you are overwhelmed by this old time charm. The lobby, the café, the restaurant and the large ornamental rooms connected to the lobby, where you can just sit and enjoy a drink in a stately environment. You can also have a great dinner at L'Alban Chambon from an exclusive menu. But as luxury hotels go, it lacks some of the facilities that you might have expected in a luxury hotel. For those of you that prefer some physical exercise there are no swimming pools. However there is a health and beauty centre at the hotel. You may also enjoy a WLAN in the hotel lobby free for guests. As there are a large range of different rooms, you will have to pay different prices. The best rates are on weekends between €130 - €160 for a superior or medium sized room, and €399 for a junior suite, while you have to pay €950 for the faboulous Suite Toscanini. During weekdays the prices are higher for the ordinary rooms, starting at €195 for a medium sized room. You can book over the hotel booking site, offering up to 60% discount on certain dates. The hotel also offers exclusive packages, e.g. romantic stays at favourable prices. Hotel reservation sites, as www.hrs.de, offers favourable prices. So you can afford to stay here if you do some research on the net.